Since the Sky Garden opened in 20 Fenchchurch street (or more commonly known as the Walkie Talkie building), I've been desperate to go, however tickets get booked up ridiculously in advance so I've never actually got round to going. However, Emil discovered that you could get walk in tickets between 10.30 and 11.30, as we both took annual leave between Christmas and New Year, we thought it would be the perfect opportunity to try our luck and see if we could get in. We joined the queue just before 10.30 and were very lucky to be let in. After having gone through tight security checks, we made it to the 35th floor, aka the Sky Garden. I had been expecting a really exclusive looking bar with lots of greenery. However, whilst there was a bar in the middle, it had more of a 'cafe' feel to it, but this may have been because we went so early in the day, it may be different at night. Having said that, the 360 views of London are beautiful and there are two staircases leading up either side of the bar in which the 'gardens' can be found, which is really pretty and allowed for the perfect photo opportunities! After admiring the views, we got the tube to Oxford Circus and wondered through the back streets to this lovely brunch restaurant called 'The Riding House Cafe' where Emil had booked us a table. 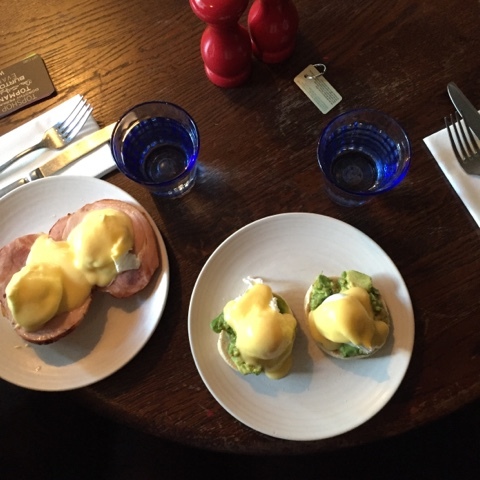 I had the most amazing avocado benedict and Emil had eggs benedict, it wasn't too pricey and the service and atmosphere was excellent, I'd definitely recommend it.